It takes 3 days to make each batch...truly a "slow" food! 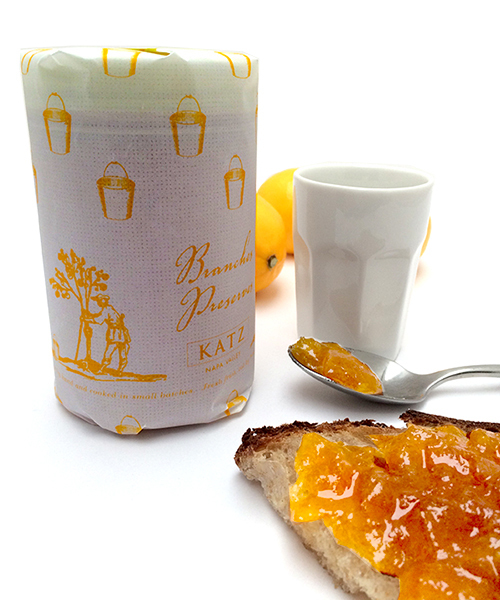 KATZ Organic Meyer Lemon Marmalade is packed with the intense piquant and tart flavors associated with this fruit. The texture is a bit smoother than our more traditional Three Citrus Marmalade, with an almost jam-like consistency. The cycle of our preserves making begins each year with our organic marmalades. We continue to make them the same way we have for the last 20+ years...using organically grown fruit, carefully removing all the peel while leaving the white pith that is then trimmed away leaving just the luscious citrus to be hand-cut, mixed with the peel, filtered water, and cane sugar. WOW! The laborious process takes three days for every batch, until the flavor-packed mixture, with full pieces of citrus in every bite is set, using no commercial pectin…a 'slow' but rewarding journey! KATZ Branches Organic Meyer Lemon Marmalade is ready to lavish on whole-wheat toast with cream cheese or goat cheese, a scone or an English muffin, or to serve as a condiment with roasted pork and warm greens! Click below for photos of the Meyer Lemon Marmalade being made by hand in our kitchen! In our Napa kitchen, each batch of fruit is skillfully cut or sorted by hand, simmered in small, open kettles, using the smallest amount of sugar and fresh lemon juice needed to set (no pectin, no preservatives).